We keep both conventional Silicon Carbide Mesh Screens and Norton Red Heat Mesh Screens for buffing floors for the 16" (407mm) Buffing machines such as the Bona Flexisand or Bona Buffer. We also keep the Norton Sand Dollar in ALL GRADES which is great for removing swirl marks, surface preparation and can be used in between coats rather than conventional maroon pads or mesh screens.. These are used for final finishing and removing swirl marks from floors. BND Abrasives is proud to be the first and only Authorised Distributor for Norton Red Heat and Sand Dollar Discs in the UK. Norton SandDollar pads have a long life (approximately 1500 sf/pad) and are extremely durable and tear resistant. The A/O grain bonded to the foam backing allows the pad to properly abrade the finish while still producing a very fine scratch pattern. Contractors can get a great-looking finish without running the risk of adhesion problems caused by improper abrasion. Norton SandDollar pads resist loading, but can be easily cleaned by vacuuming off or rinsing with water and then reused. 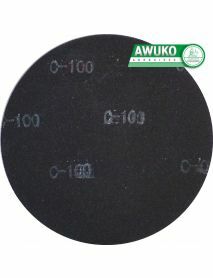 They are used just like a screen or maroon pad, using a white pad or maroon pad as a driver and can be used on any kind of finish: oil, water, or acid cure; but not recommended for pre-finished floors. 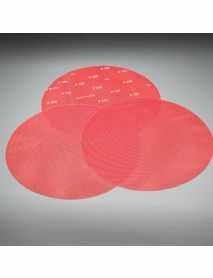 The cut-outs in the pad help with dust extraction and to minimize loading. Traditional PSA strips can tear and curl under easily which could leave adhesive residue on the finish. Also, if hook and loop strips are used, the paper can curl under and the hooks can scratch the finish. With Norton SandDollar there is no guessing at how many strips to use, what grit to use, and how to place the strips on the pad.